In an unusual case – one of despair, hope and triumph – a seven-year-old Cambodian boy’s previous diagnosis and treatment helped save his baby sister. Kim Sroy, now aged seven, suffered was diagnosed with cirrhosis of the liver and underwent a liver transplantation at 18 months of age. In doing so he unknowingly also helped his younger sister, who was detected with jaundice within the first few weeks of life. After a successful liver transplant, Kim was discharged in the third week, but within two years he developed swelling all over his body and was brought back. Kim had developed chronic renal disease due to transplant-related thrombotic microangiopathy, a rare condition where the small blood vessel get occluded due to the damage to their inner lining. This is a very rare, but devastating complication of transplantation with mortality ranging from 60 – 90 percent. Upon diagnosis, doctors realized that Kim urgently needs the renal transplant and was put on hemodialysis. He underwent a kidney transplant. Now it’s been more than five years and Kim is hale and hearty with both his liver and kidneys doing well. In 2017, Kim’s mother seeing her daughter Angel’s eyes become yellow after birth brought her to Apollo Delhi for an assessment. “Given our understanding of Kim’s case, we immediately investigated Angel. She too was diagnosed to have the paucity of bile ducts. 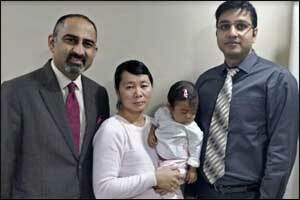 Her liver disease continued to progress rapidly, resulting in end-stage liver disease within few months. The family took the baby to France for a second opinion where experts concurred with our plan. She underwent a liver transplant at the age of 11 months” said Prof Anupam Sibal, Group Medical Director and Senior Pediatric Gastroenterologist and Hepatologist, Apollo Hospitals Group. “The awareness about liver transplantation has increased considerably and the Apollo Program has now transplanted more than 280 children from 20 countries”, added Prof Sibal. “Angel was really small and deeply jaundiced. Such small babies are a challenge as the donor liver has to be specifically reduced as per the size of the small abdominal cavity, kind of custom built to fit in. Big size grafts can create a lot of post-operative problems but fortunately for her, the reduced liver worked really fine. Also joining the tiny blood vessels can be quite challenging in small babies”, said Dr Neerav Goyal, Senior Consultant, Liver Transplant and Hepatobiliary, Pancreatic surgery, Indraprastha Apollo Hospitals. “In the last 3 months alone, 10 children including babies as small as weighing 3.5 kg have been successfully transplanted”, added Dr Goyal. The surgical team comprised of Dr Puneet Dargan, Dr Arun Venuthurimilli and Dr Kumar Vaibhav and a medical team comprised of Dr Nameet Jerath, Dr Vidyut Bhatia, Dr Akshay Kapoor and Dr Smita Malhotra.